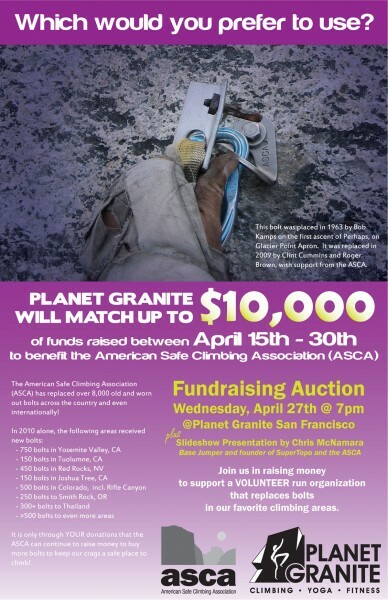 ASCA Fundraiser 4/27 - Planet Granite SF - All $$$ matched! Planet Granite San Francisco is hosting our Annual Fundraiser on April 27. Alex Honnold, Greg Barnes and I will be doing a presentation on what the ASCA has been up to. Alex will present his latest adventures. I'll tell the wild story of how the ASCA started and Ill throw is some BASE jumping cuz everyone seems to dig it. We will also have bolts on display, a silent auction, live Super auction, food, drink... its gonna be great! - THE IMPORTANT PART: PLANET GRANITE IS MATCHING ALL DONATIONS AT THE EVENT AND BEFORE APRIL 30. We need auction items. Here is a list of current auction items. If you have anything to add, it would be awesome! If you want to donate to the ASCA, please do so before April 30 so that it gets matched. Along with this fundraiser, I will be holding a big auction on eBay. Ill be selling some of my old Aliens, pitons, climbing gear, outerwear along with anything else the climbing donates to be auctions. Shout out to Planet Granite SF! - They have helped us raise over $20,000 in the past and are a BIG reason the ASCA has been able to replace thousands of bolts in the last year. The ASCA has now replaced 8000+ bolts. Just got word that Alex Honnold will be our speaker! Also, we now have a Facebook page. If you get a chance, please click on the like button. Thanks! Here is the event page on FaceBook. I hope many of you can make it! Awesome! I go to PG, and really want to learn more about bolting! My goal is to put up frequent bolts on Thunderbolt's summit block. Sierra could have a cool summit block sport-climb. : ) Than I will deal with Doodad.. If I'm in town I'll be there! Just in case it wasn't clear, Planet Granite is matching ALL donations to the ASCA for April 15th-April 30th, so even if you live nowhere near California, make your donation then and PG will match it! There wil be tons more stuff for the auctions (both online and at the event), we'll keep you posted! Are you using this address for donations? That address is Chris' parents place. The official address for the ASCA is PO Box 1814, Bishop, CA 93515-1814, but the actual address right now is: ASCA c/o Greg Barnes, 603 Maestro Ct, San Jose, CA 95134-2606. We don't want to change the address since I move apartments fairly often (might have to move again in September), so for now my friends in Bishop send over the mail - but there is a delay, often several weeks. Also - Online Donations are accepted too - http://www.planetgranite.com/asca. Thanks everyone! We hope to see you there. Let's bump this one, too. Bump - tell your friends! When is the EBAY stuff coming up and the link?? The match starts TODAY! You can donate online at http://www.planetgranite.com/asca OR even better, come to our Auction to hear Chris McNamara and Alex Honnold speak plus get some awesome gear in exchange for the money you donate. Bump - all donations to the ASCA are being matched!!! Yes, you don't need to RSVP on Facebook. That just helps us know how much room we need. Can't wait for this event.